The player can now travel to a completely new star system. However, the military has the say there! + There is a completely new star system that can be unlocked! The new worlds in the new system are regularly updated! + In the new star system there is a new special weapon, with which you can double the strength of the Defender! + In the new star system you can equip yourself with new weapons! + The enemies now have multiple spawn points and can appear at up to four different locations! + In the new star system, there are new strategic weapon options to choose from to affect targeting! + We’ve added new music and sound effects for the new star system! + In addition, we have optimized many small areas in the game and laid the foundations so that we can continue to add cool new features! We are still working on the BIG UPDATE which will be out in late February 2019. The main reasons why this update will be released a little later is that we had to take some weeks off due to illness and second that we integrate many new features besides new worlds. 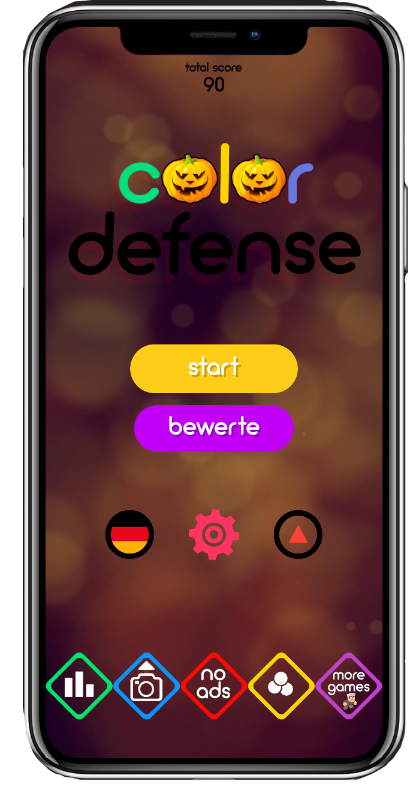 This version allows players to create their own COLOR DEFENSE game levels! 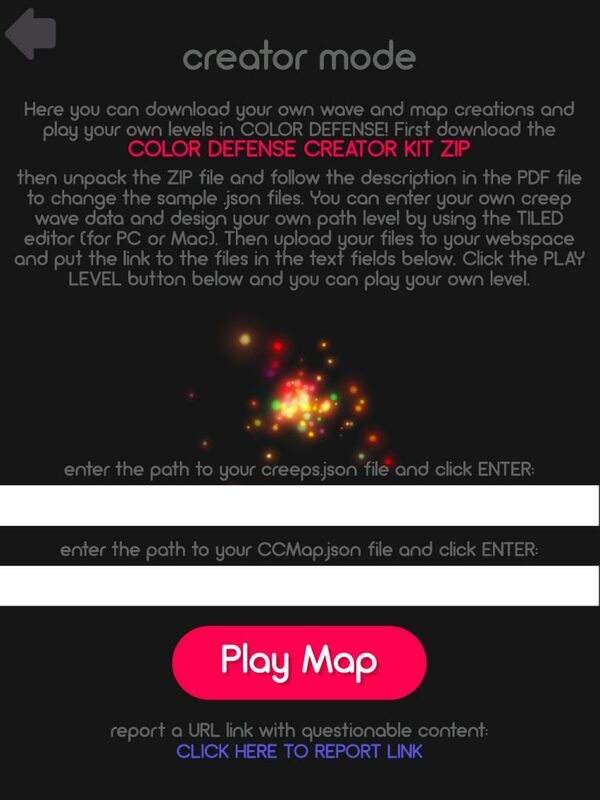 DOWNLOAD THE CREATOR KIT FOR COLOR DEFENSE HERE! To create your own game levels you also need a text editor (such as Sublime Text or Notepad ++) and a PC or Mac with the TILED Editor. The BETA will only be available for iOS and you need the Testflight app to play the BETA version. GET THE TILED EDITOR HERE! With this BETA version you can then test and play your own game levels. (Please note we have locked all other new content in the BETA because we are still working on those features.) In the .Zip File you will find a PDF with instructions on how to create your own game levels. and if they are exciting, they also get a chance for a release directly in the official version of Color Defense and are thus playable for thousands of players! Whose game level is selected will receive an App Store or Google Play gift card as a gift! We have big plans for 2019, will make COLOR DEFENSE even bigger, and in January we’re laying the foundation for our next game, which we’re not allowed to reveal at the moment. We would like to take this opportunity to thank all players for the support and the great feedback! We wish you all a Merry Christmas with your loved ones! Change your date on your device to “November”, then Color Defense version 2.3 will work like normal. Wait for the update 2.4 and download it to fix the small bug. We wish you all a Happy Halloween! Please note you now can get all InApp-Purchases for our free to play Tower Defense game COLOR DEFENSE up to 50% cheaper than the original price! Just get the free to download game here: www.ColorDefense.de and check the store inside the game to access the Halloween sale in the next hours! 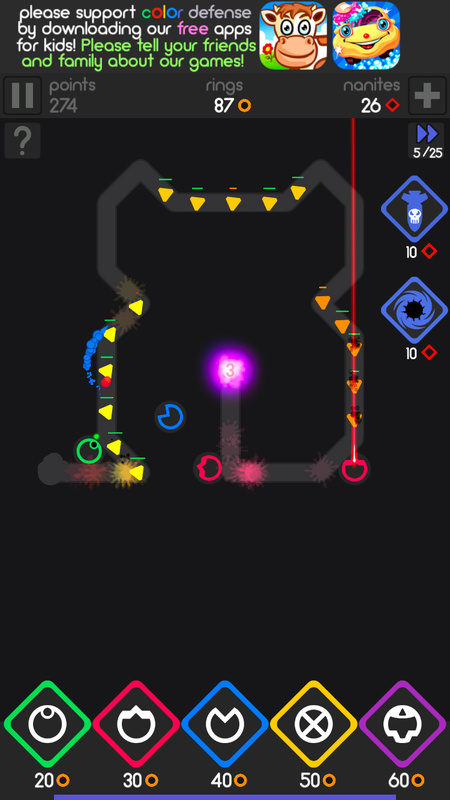 Regarding the next update for COLOR DEFENSE: We are working on new levels (of course 🙂 ) and we are testing the first endless map which will be a part of the upcoming update version 2.3 in a few days. 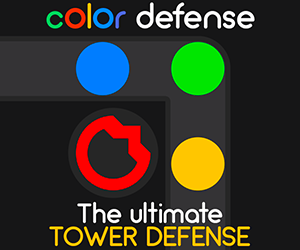 The new update for our mobile Tower Defense hit game COLOR DEFENSE is now available on the App Store for iOS and on Google Play for all Android devices! The game is optimized for all new iOS devices which makes it the perfect game for all the new things Apple is announcing today on their #appleevent ! + BIG NEWS: We have added a new special weapon! A singularity bomb! + BIG NEWS: After winning a level, the level of difficulty will be shown! Thus, you can now see what level you have won in which degree of difficulty! + BIG NEWS: Some of the creeps now have immunity to certain weapons! 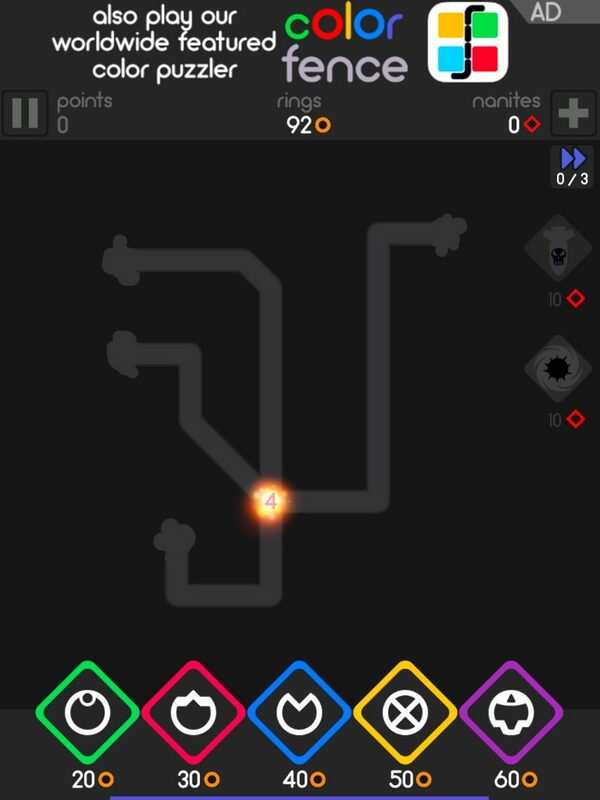 + BIG NEWS: You can now take screenshots of won levels and send them to your friends! 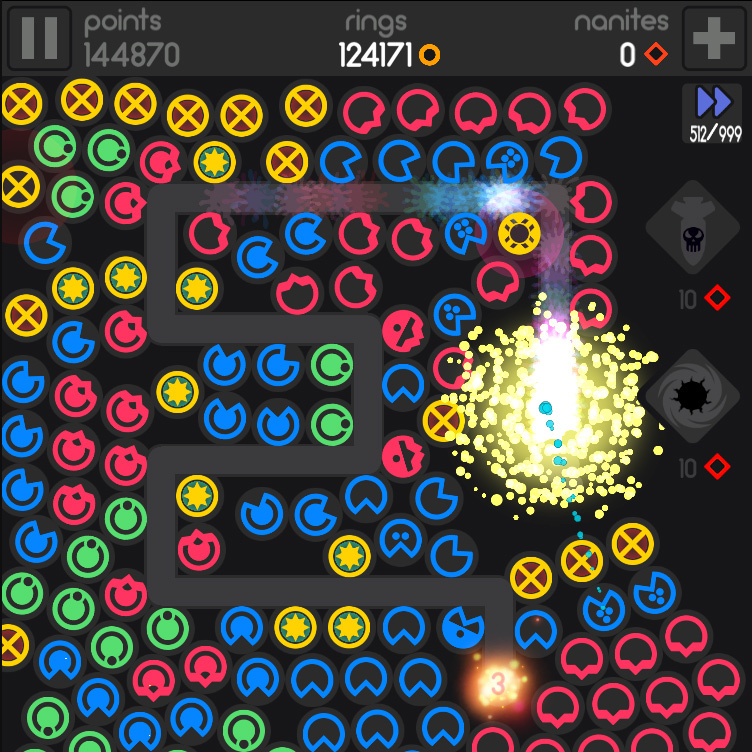 + We have also increased the random level count and added more random waves! + We have eliminated minor bugs in the game! + The setting screen has been restructured and expanded! + We have added new graphics and revised some of the old ones! + We have made optimizations! A “New Games We Love!” Apple featured game! 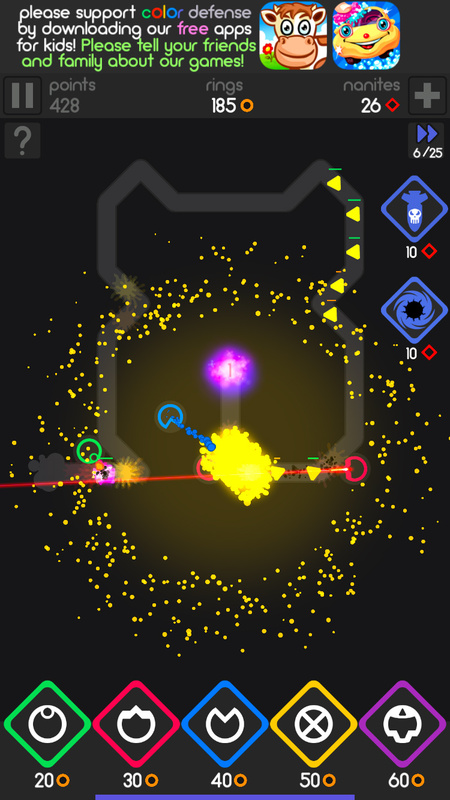 You now can download and play our new Apple featured game COLOR DEFENSE! It’s a unique hybrid of a Tower Defense and puzzle game. The perfect game for strategy fans and puzzle lovers alike! + We have added new selectable difficulty settings! + We have added 20 new selectable languages! + You now can listen to your own music while playing COLOR DEFENSE! + We have added world 4 with 9 new levels! + We have added new sound settings (voice,music,sfx on/off)! + We have reworked some GUI elements for better play! + We have fixed some minor bugs! GET THE UNIVERSAL FREE GAME FOR iOS! GET THE FREE ANDROID GAME ON GOOGLE PLAY! The new update version 1.2 will be available in just a few days from today for iOS! If you like the game please write a review in the store to help us developing new content and updates. Please also tell your friends and family about COLOR DEFENSE. 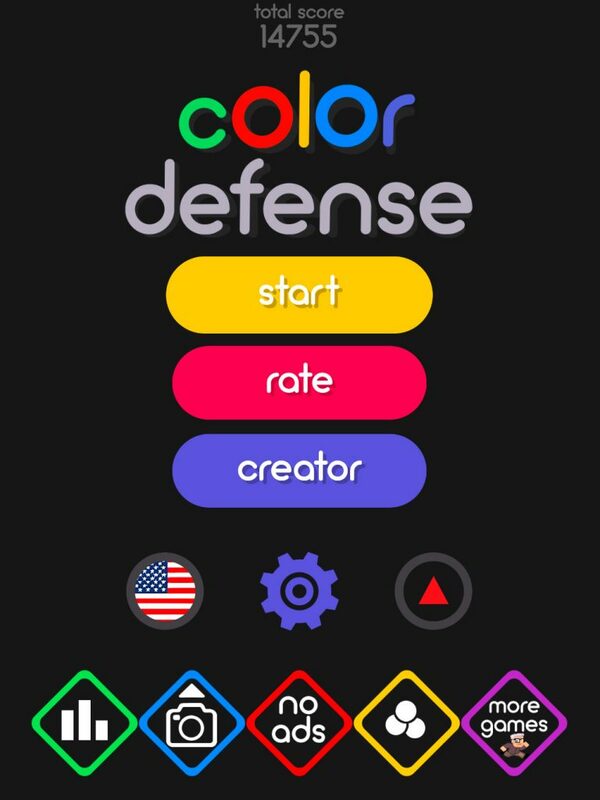 PRE-ORDER COLOR DEFENSE for iOS! DOWNLOAD OPEN BETA ANDROID COLOR DEFENSE!